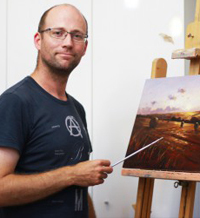 Tony Parsons is an award-winning impressionist figurative life artist and landscape painter. His urgent, fluid style captures the essence of Brighton and the surrounding area. He works predominantly with oils and marker pens. About the artist: Tony Parsons is a full time artist. He paints every day without fail, attempting every aspect, style and subject in the pursuit of technical excellence. At the moment, about half of Tony's work is en plein air (outside). He tries to capture an atmosphere more than just a single moment, and can be found nearly every day painting on a beach or at a beauty spot around the country. His workmanship is urgent and fluid and is an exercise in describing how it feels to be in that place. His studio work is more thoughtful and generally dispenses with the urgency of making the outdoors a studio. Tony worked at sea for many years and still drives the Brighton Lifeboat, so boats are a common theme in his paintings. He loves the edges, water, mud and sand, and the coast is a never ending inspiration. He also enjoys creating figurative life studies. He’ll often invite bystanders to pose and feature in his landscapes.